Why Choose Sump Pump Installation? 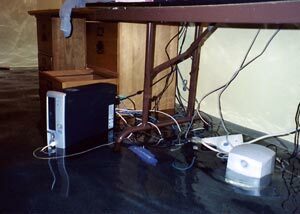 It's worth the investment to make sure that your basement is protected from flooding and humidity problems. A dry basement becomes another usable level of your home for storage. Alternatively, it can be finished into new living space. At Basement Systems, we find that the reactions to a wet basement or crawl space can vary drastically from one homeowner to the next. Our dealers have heard requests ranging from homeowners who'd like their home bone dry to people who tell us, "Just make sure the water doesn't get so high that it puts out the pilot light in my furnace." 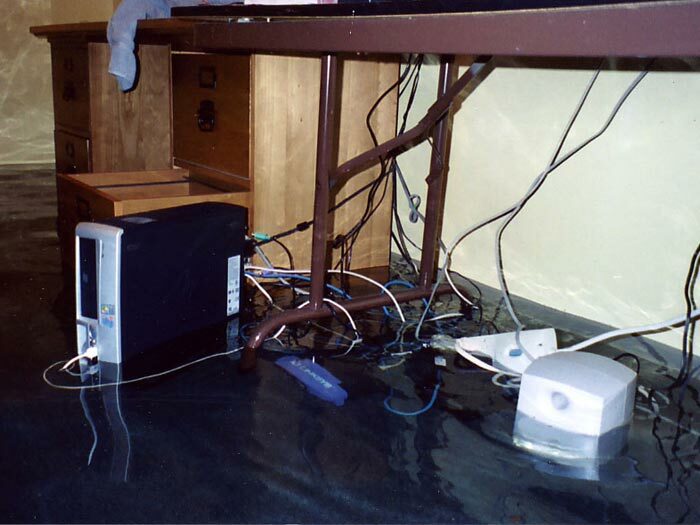 Additionally, potential buyers will expect your basement or crawl space to be flood-free when purchasing. If it's not, you will often have to discount the value of the home by 10-20% or more! Our sump pump systems have been used to successfully waterproof hundreds of homes throughout North America and Europe! 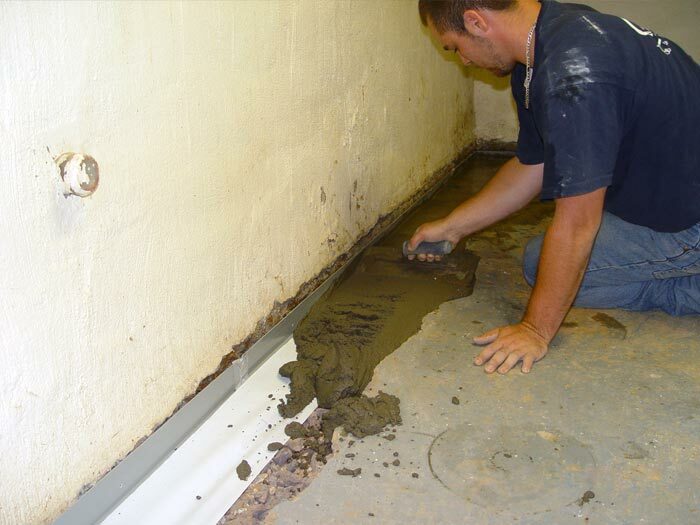 Our waterproofing crews can install a complete system in your basement or crawl space in one, perhaps two days. It costs you nothing to meet with an expert for a free basement waterproofing quote! To get in touch with your local dealer, contact us by phone or e-mail today! Basement Systems Dealers have exclusive access to a great line of patented sump pump products. Our completed system includes a lifetime warranty that's transferable to the next homeowner -- a great edge when selling your home! 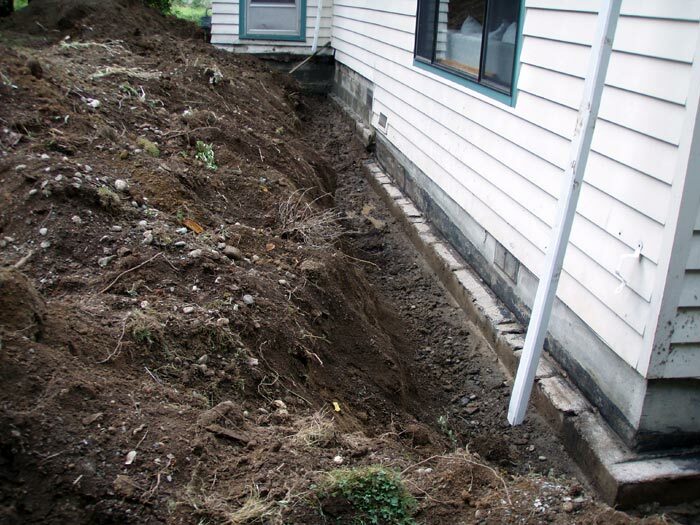 If a contractor is trying to protect your basement from flooding as the home is being built, he will have excellent options in front of him -- many of which involve accessing the foundation from the outside. Once your house is built and you're living in it, the ideal changes. At that point, the best option will involve something that can be installed quickly, with little disturbance to your home. Of course, you'll also require a solution that you can rely on to protect your home and valuables. A perimeter drain and sump pump installation can be installed in your basement in a day or two -- with minimal disruption or damage to your landscaping. Your sump pump system should be quiet, reliable, powerful, and complete with a battery backup. We recommend a submersible sump pump with a cast-iron housing, as they are self-cooling in the water they're submerged in during operation. What Are The Other Options For Waterproofing? While a sump pump and drainage system is the primary way to waterproof a basement or crawl space from the interior, there are a couple exterior ways that some contractors will recommend. These types of solutions will generally involve some level of excavation, and are not generally services that are provided by Basement Systems Dealers. 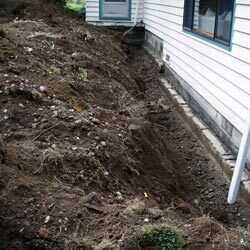 This solution involves excavating the entire exterior of the foundation, exposing the footing to install a drainage system around the exterior of your foundation. If your home has gardens, shrubberies, porches, or other landscaping around the edges of the home, the contractor may require them to be removed. To keep mud away from the drain, a sleeve of filter fabric will often be wrapped around the drain. In most cases, a bed of clean stone will be placed above and below the drain to also prevent clogging. 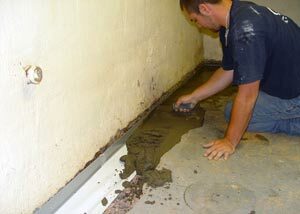 In some cases, an elastomeric membrane is applied to the foundation wall to help seal out moisture and address small cracks. We find that this kind of drain system works for about ten years before clogging with mud. After that, the process will need to be repeated. 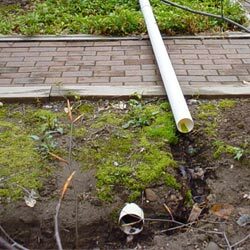 Many homeowners discover that this drain system was already installed around the home (and has already failed once) when installing a new exterior drain system. And with the price tag on this system, which is about twice that of an interior system, this is not something you'll want to do twice! Some homeowners will attempt to bypass a sump pump system entirely, opting instead to pitch their drain (whether interior or exterior) downhill, using the force of gravity to direct water from their basement. Under ideal conditions, with your yard pitched just right and the drain installed properly, this can work! However, with no sump pump to actively move water away from your home, these drains may not compensate for heavy water volumes around your foundation. 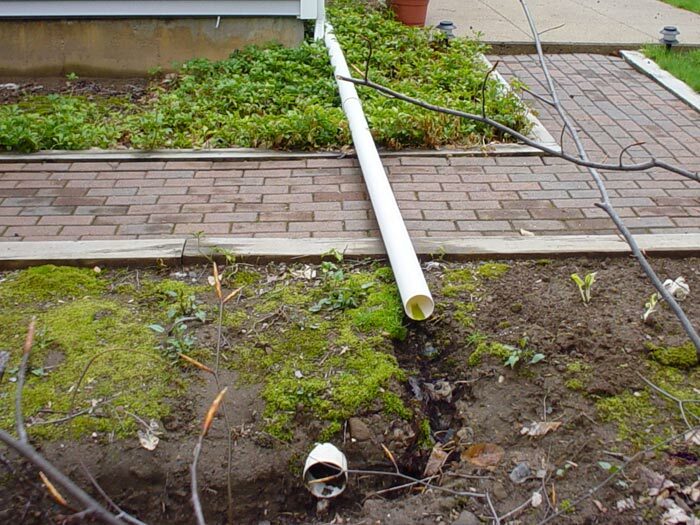 What will you do if the discharge line opening becomes blocked by leaves, or other forms of debris? What happens if the discharge opening freezes over? Systems like this can be extremely unreliable if not examined regularly. During a rain, you must observe water coming from your daylight point on the discharge line. A screen will help prevent animals from nesting or expiring within the drain, which would clog your system. If not installed in a bed of gravel, the system can silt up quickly, causing it to fail. Upgrade Your Basement For A Warmer, More Comfortable Home! We have a locally owned and operated authorized Basement Systems Dealer in your neighborhood that's standing by to help you! Each of our full perimeter waterproofing systems includes a written warranty -- one that's transferable to the next owner of your home. This is a great selling point when your home is on the market! To schedule a free, no-obligation sump pump installation quote, contact us by phone or e-mail today! 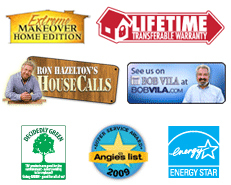 We'll put you in touch with your local experts, who will help you design a system that's ideal for your home. Each free waterproofing quote includes an on-site inspection and measurement of your basement or crawl space -- as well as a professional consultation, where we answer any questions you may have. Our innovative basement software will help us work together to create a system that's ideal for your home. As an additional courtesy, we'll mail along a free copy of our full-color waterproofing book, which should arrive before our scheduled appointment. This powerful research tool is packed with everything you need to know about waterproofing your home -- including details about our products and services.